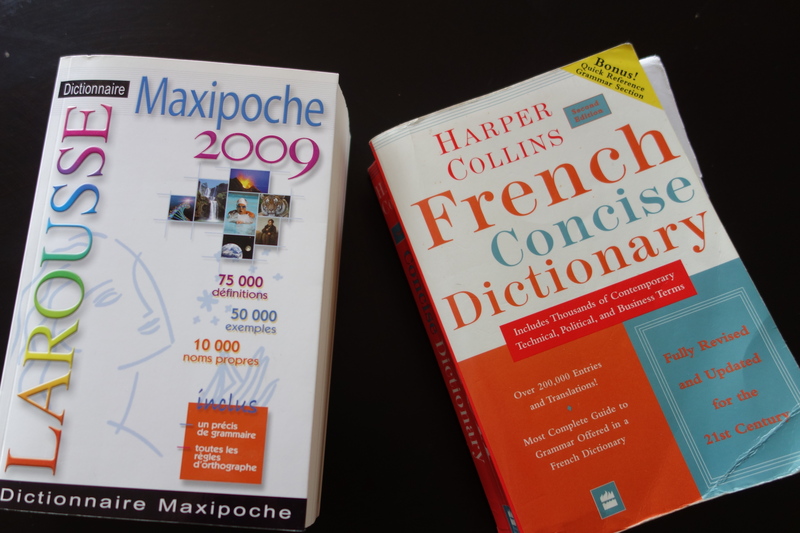 I started learning French when I was 29 years old. In my day, foreign language education began in high school and we only had to take two years. In college, my major (microbiology) had no foreign language requirement. Funny story: I really wanted to take French in high school, but my mom said to me: “You’ll never have any occasion in your life to use French. We live in Arizona. You need to take Spanish.” So I did. Then I married a Frenchman. I love to remind her of this whole event sequence. After finishing grad school, I met a few French people, fell in love with the language, and decided to take night classes at a small conversation-oriented school to learn how to say “Bonjour” and “Paris” so it would rhyme with “Whee!” A couple immersion programs in France, some private lessons, and a French husband later, and my French is, overall, decent. Because my “formal” education in French has been minimal, I have holes in my knowledge. Sometimes they are big and gaping, like the issues I have with masculine vs. feminine. Already a difficult concept for the Anglophone, I spent a lot of years whatever-ing the whole thing until I had to admit it actually does matter. I can’t be the only one who struggles with this in French. Why oh why can’t it be easy, obvious, like it is in Spanish? I love my Visual French-English dictionary, too. 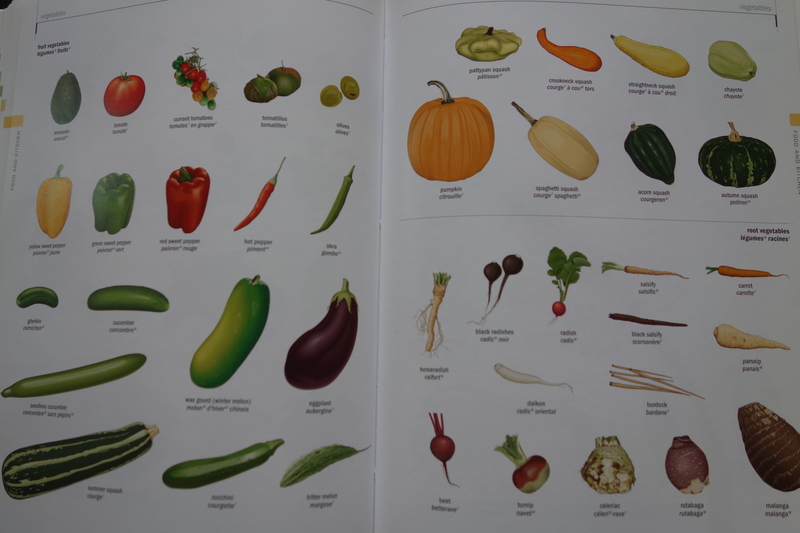 It’s fun to thumb through, and I do learn from it! The best/worst advice I’ve (often) received: You just have to learn as you go. Because there are so many rules and exceptions to rules, learning as you go, from the beginning, is the best route. I tried to do note cards the other day, based on some of the patterns listed in the websites above. That lasted about 5 minutes before I threw all the note cards I’d worked so hard to create into the recycle bin. Does anyone ever really learn that way? For something other than a cram session for an exam where all the info will be forgotten in a week or two? I’m a complete grammar nerd, but I still recognize a futile attempt when I see it. Part of my research into bilingualism and teaching languages has shown that our understanding of how best to acquire new languages has evolved greatly, and continues to evolve. It’s much more of an organic process than our typical teaching methods (i.e. rote memorization and recitation) allow for. 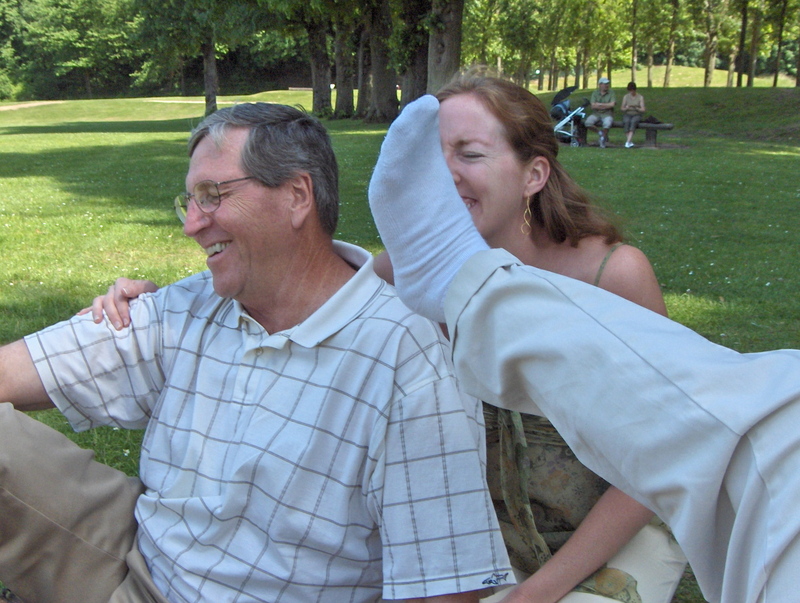 I’d rather have my brother stick his foot in my face while I’m posing for a sweet picture with my dad in France than study from notecards. I need to build associations and habits, not stare at cards. I need to think and speak in French when I go to the grocery store so that I know it’s “la” banane and “le” brocoli. I need to look around my house, think about, talk about the objects I use every day. Le livre. La cuillère. Le four. La table. And so on. I just want a simple rule or two to follow, but that’s not how French works. It’s going to be a long process before this whole gender thing comes naturally, and accurately, for me. Yet here are couple that have stuck in my brain for years: problème is masculine and solution is feminine. Hmmm. This entry was posted in French, French Language and tagged Bilingual, France, French, French Language, Grammar, Learning a language, Learning French, Multilingual by A French American Life. Bookmark the permalink. I understand completely the problem that gender can cause. I am married. There is no rules and it is absolutely arbitrary. Why is a purse masculine for example, un sac à main, I could not tell you. But even if you make a mistake in the gender, the word itself is still understandable, and the majority of french speakers will find it cute. As a french man, I have more difficulty with the english pronunciation that you have with gender. Through, tough and dough are a good example. You can nor guess the spelling if you hear it for the first time or the pronunciation if you were reading it for the first time. Others are just a wander. Violin and viola… How can that happened. Prononciation in french, even if not easy is most of the time, there is exception as usual in french, is pretty straight forward. So even if the gender is wrong, communication can happened, it still works. And it is so cute. You are so right about pronunciation in English – we have so many arbitrary “just have to know them” words. Read (present tense) read (past tense) is one of my favorite examples. Glad to hear that gender mix ups are cute 🙂 Though I’m moving beyond wanting to be cute. I want to be impressive, instead, with my mad French skills. I know you want perfection. I read once that the way memory forms is by creating synapses. It says in the paper that you have to see it as each new thing creates a path, if the path is not used, it will disappear or be hard to find as other memories grow. Each of those small paths then need to be used in order to grow as avenues, boulevards, freeways. The best way to do it is to read or listen. I do listen so some books in english while working to learn new words and there pronunciations. If you have spare brain time you can listen to thousands of book there http://www.litteratureaudio.com/ , and you will learn those genders without even noticing. But please, if you stop the cuteness of mixing gender, keep at least a bit of accent! And your french is already impressive! Aww, thanks Patrice. I don’t think I’ll ever lose the accent, as much as I’d like to. Nice explanation about what goes on in our brains when learning new languages. And yes, I’m upping the ante on my French this year – more reading, more talking, and listening to books with the links you’ve given me. Now all we need is for you guys to visit us in CO so we can practice! It must be difficult to deal with the feminine vs masculine issue in French. I think there are some rules to know if a word is feminine or masculine (for example, I’m almost sure that many words ending with “ée” are feminine: la mariée, la jetée, la criée, la dictée…) as I had to memorise them at school. It was boring and not very effective. Practice is better. Try to think about all the words you need to use on a daily basis and use them in sentences with the right “déterminant” (ie. “la”, “le”, “une”, “un”). You will do it automatically after a bit of time, courage ! Thanks, Judith! There seem to be a ton of rules, and exceptions, that I’ve found, so I’m working on the practice instead – reading, writing, speaking, listening… Someday, maybe, it will be easy for me! Yikes! I’m planning on doing the questionaire this weekend. I’ll see if I can do it in French, too! I really enjoy reading your blog. It’s all the more flavorful to me that I recently left France to live in the USA (Seattle). So I kind of experience the same things on the other side. I totally agree with Patrice regarding pronunciation in English. It’s just a nightmare for me. When people have me repeat, I’m never sure whether it’s because of my pronunciation, or because I don’t stress words correctly (maybe both?) Like Patrice, I think that reading and listening to English is necessary to create synapses ; but, too me, it’s nothing like speaking. Your ear can hear how a word is pronounced, but you won’t really know how to pronounce it before you utter it. I didn’t know that about gender changes in plural. UGHHH! Oh, and welcome to the US! Seattle is a beautiful place – especially in the summer. Enjoy! I had a somewhat similar experience when learning German in high school (which sadly has not served me much since). I was already thoroughly familiar with the concept of masculine and feminine nouns (yay French!) but in German they also have “neutral” words, which made it kind of tricky. I did eventually get the hang of it, mainly by doing what you’re doing now: just learning the “genders” of the words as I came across them. That’s pretty much all you can do, really, even when you’re a native speaker. It’s a little easier if you grow up hearing the language spoken, but you still have to go over it fairly extensively at school. Thankfully, I had a much easier time with Spanish since most words are the same “gender” as in French. Yes – the way German throws in the neutrals must be very confusing. My husband took 7 years of German and that really threw him off. Masculine/feminine nouns are so frustrating, I totally agree! HOW AM I SUPPOSED TO KNOW?! I speak fluent French too but this still trips me up sometimes, and I fear it will no matter how long I live here! If you haven’t already, you absolutely have to read the chapter in David Sedaris’ Me Talk Pretty One Day about learning French and masculine and feminine nouns. It’s hilarious because it’s true. LOVE Sedaris. Especially his stuff on learning French. I can see that dealing with different genders of words can be a challenge when you’re not used to it. One thing that I’ve always been told is to try to learn the gender with the word, i.e. learn ‘la table’ (or ‘une table’) rather than just ‘table’. With learning Welsh in recent years, an added complication is that articles do not change according to the gender of the words but some adjectives do depending on the letter they begin with. I unfortunately didn’t learn it the first time around, so now I’m having to go back 😦 Wow – Welsh sounds complicated! So fascinating, the different rules and challenges in different languages. I really need to go back and study linguistics; I think I missed my calling. Reblogged this on Catch Her Eye.